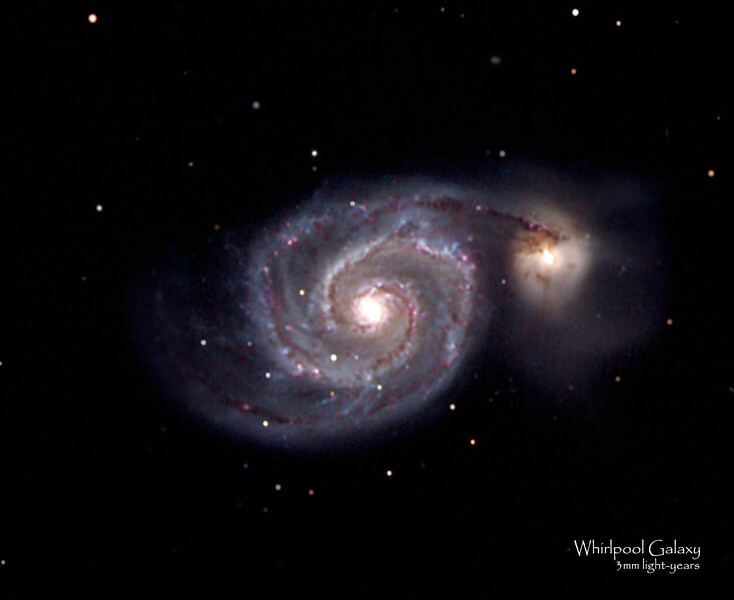 The Whirlpool Galaxy (also known as Messier 51a, M51a, or NGC 5194) is a spiral galaxy located at a distance of approximately 31 million light-years from the Milky Way Galaxy in the constellation Canes Venatici. It is one of the most famous galaxies in the sky. The galaxy and its companion (NGC 5195) are easily observed by amateur astronomers, and it is also a popular target for professional astronomers, who study it to further understand galaxy structure (particularly structure associated with the spiral arms) and galaxy interactions (since the two are showing the impact of a close passing by. A black hole, surrounded by a ring of dust, is thought to exist at the heart of the spiral. Recent simulations bear out that M51's spiral structure was caused by NGC 5195 passing through the main disk of M51 about 500 to 600 million years ago. In this model, NGC 5195 (the small galaxy) came from behind M51 through the disk towards the observer and made another disk crossing as recently as 50 to 100 Myrs ago until it is where we observe it to be now, slightly behind M51.